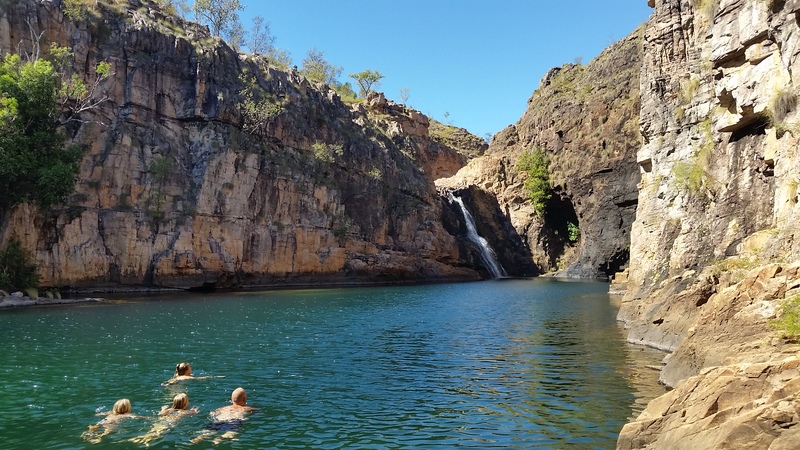 Over the years we have heard mixed reviews about our next destination, Kakadu National Park, more then often people would use the term ‘Kakadon’t’. Even as we left Katherine, we had people saying not to go as it’s so dry and there is no water, etc, etc. So of course, taking on board all that advice we decided to head straight there, with our eyes and minds open as to what to expect. After we had paid for the parks pass at Katherine I set about reading the information booklet to work out our plan of attack. We would enter the park from the south, hopefully going the opposite way to everyone else, and we would work our way through the many regions and landscapes. 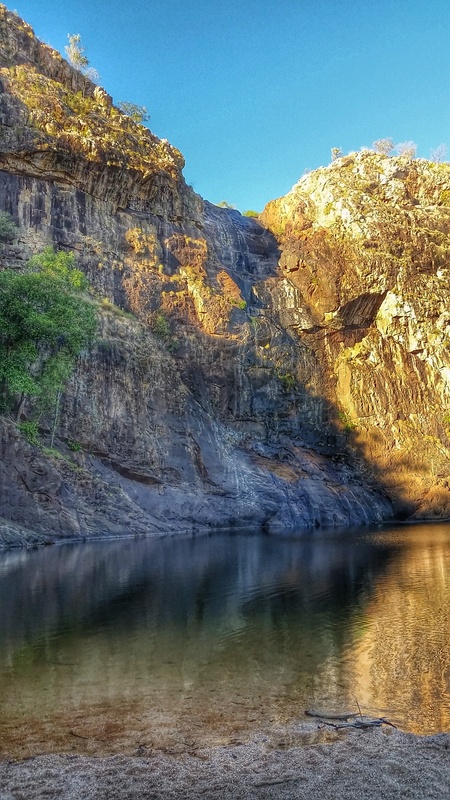 Kakadu National Park is Australia’s largets national park, covering over 20,000 square kilometres, and is listed twice on the UNESCO World Heritage List due to its amazing natural landscape and its cultural history, with archeologists having uncovered proof that Aboriginal people have lived here for over 50,000 years. 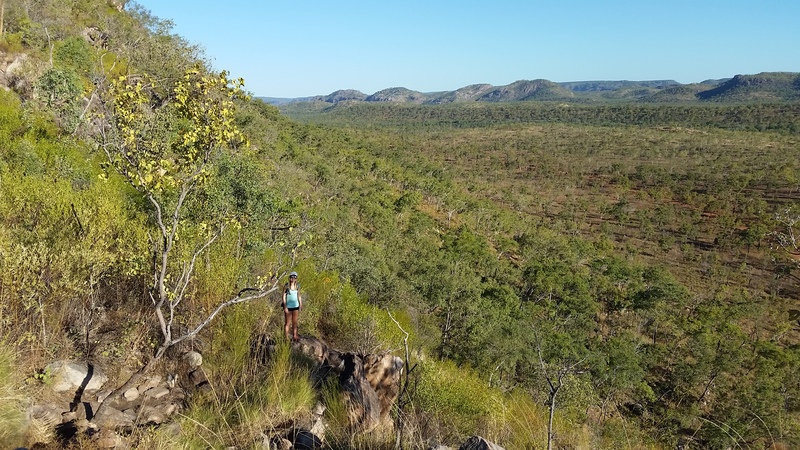 The biosdiversity within Kakadu is one of the reasons for its world heritage listing, with the landscapes ranging from the dry savanna woodlands and stone country, to the monsoon forests, mangroves, rivers and billabongs. 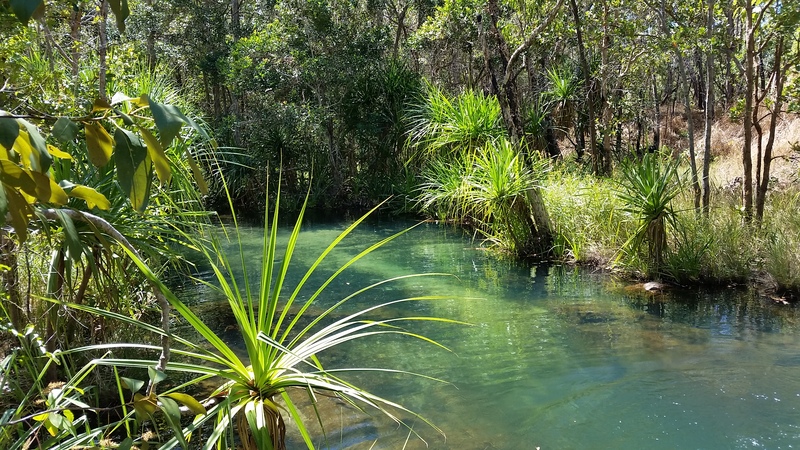 All of these habitats are broken up into the different regions, starting from the south where we entered the park, there is the Mary River Region, Jim Jim Falls and Twin Falls Gorge region, Yellow Water region, Nourlangie region, East Alligator region, Jabiru region and lastly the South Alligator region. 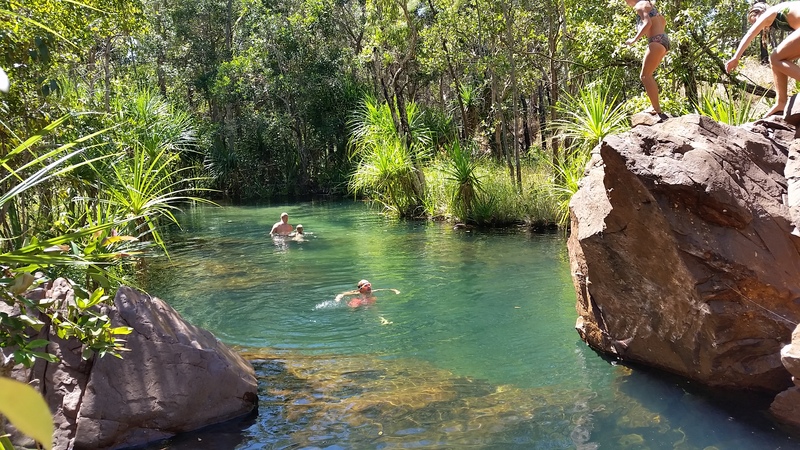 Gunlom Falls, our next campsite, is situated in the southern end of the park and is part of the Mary River Region, with the traditional owners believing that the Creation Ancestors (Dreamtime) rest here in this region and that they should not be disturbed. The campsite at Gunlom was well equipped with solar showers, running water and flushing toilets, with the camp host coming around each evening to collect the camp fees, which for us was the family rate of $38 for the night. 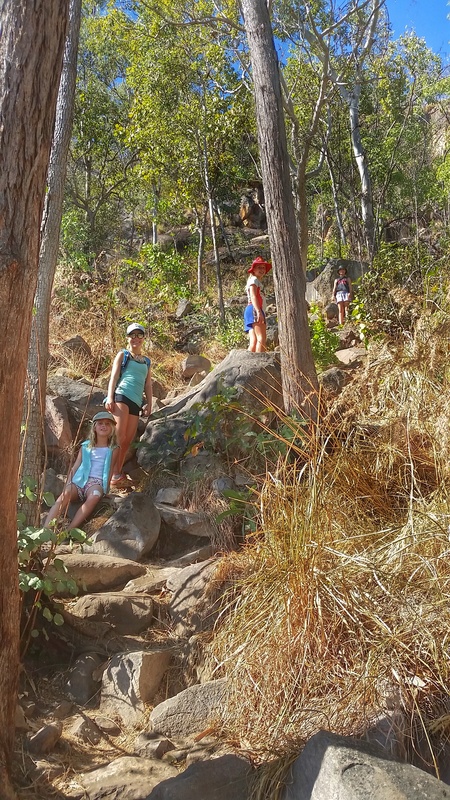 After waiting out the hottest part of the day by about 3pm we decided we had had enough sitting around, so filled up our backpacks and did the 2km return hike to the top of Gunlom Falls. It was a tough hike and pretty much just went straight up for about 1km, with the track resembling a goat track, however we had read and heeded the warnings and were prepared for the heart racing climb. It was well worth the effort as the pools above the falls were amazing, even though the falls weren’t falling that much, it was enough of a trickle to keep the water from going stagnant. 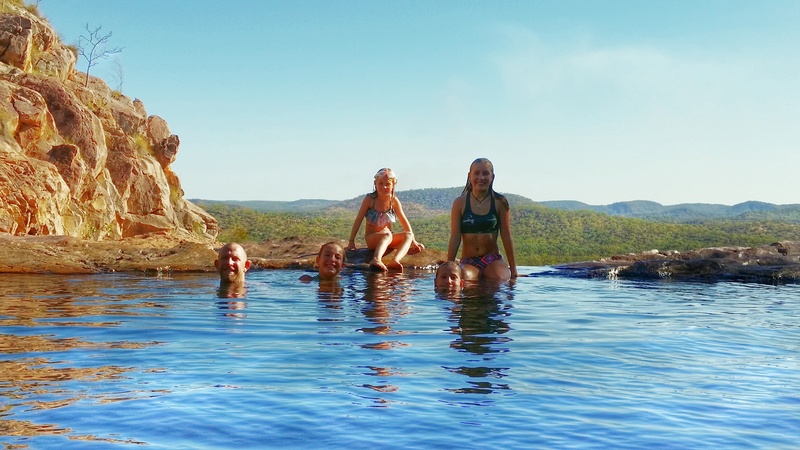 The rest of the afternoon was spent exploring around the pools, taking the customary photo of us in the natural infinity pool and enjoying afternoon tea up there. We even ventured further back to about the 3rd or 4th pool, where we were by ourselves and Nik and the girls were happily swimming until I noticed that we couldn’t actually see where the water came from ‘upstream’…… I rather hurriedly asked them all to hop out, because as far as I’m concerned ‘upstream’ could have been croc city and all the crocs were heading on ‘downstream’ for some afternoon tea….. So with that they scurried out of the water and we moved back up the rock embankment a few metres (at least 10!!!!). The customary Gunlom Falls photo. Views from the top of the falls. Chillin in our own private oasis. Back down at camp we also went for a swim (with about 20 other people, safety in numbers….) 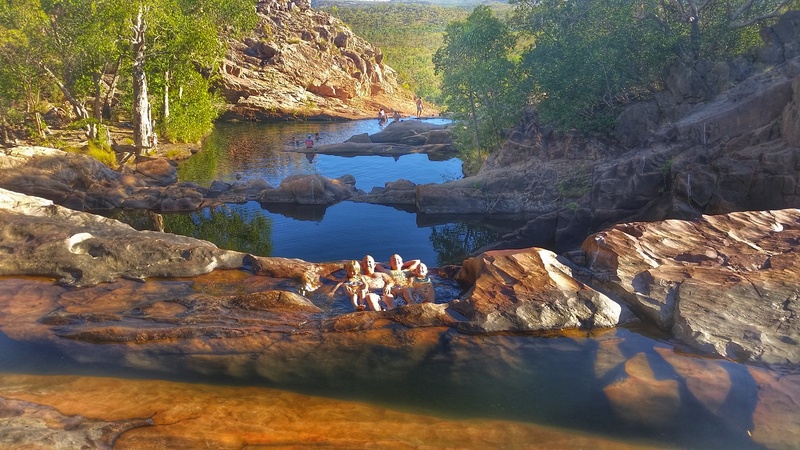 at the plunge pool at the foot of the falls, it even had a lovely big sand area with which to sit and relax on. The camp host told us later, that for some reason, the Creation Ancestors had decided to deliver the sand to the area during the wet season back in February this year, as apparently before that it was quite a muddy entrance to the plunge pool, I didn’t believe him and thought the park management had it trucked in, but he was adamant it had happened naturally.…….. As we were walking back to our van we couldn’t help but notice quite a boisterous group of Indigenous kids and adults camped not far from our van, they were having quite a good time. Later on that night though, we then had the pleasure of listening to them as they played the didgeridoo, clapping sticks and sang some songs. After an hour sitting mesmerised by the didgeridoo, they then stopped and began playing the guitar instead, with all of them now joining in and singing their ancestral songs. 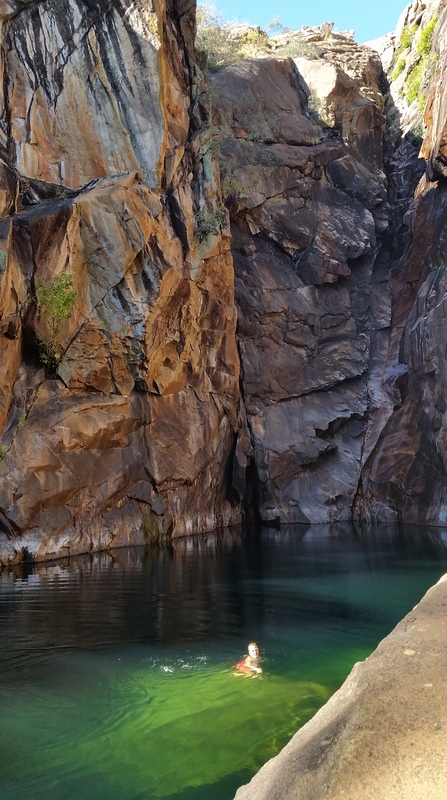 The sounds coming across the campground were captivating, together with the smells of the surrounding campfires and the stars and milky way above, it made our first night in Kakadu very surreal, as we were not expecting such a spontaneous natural cultural welcome. 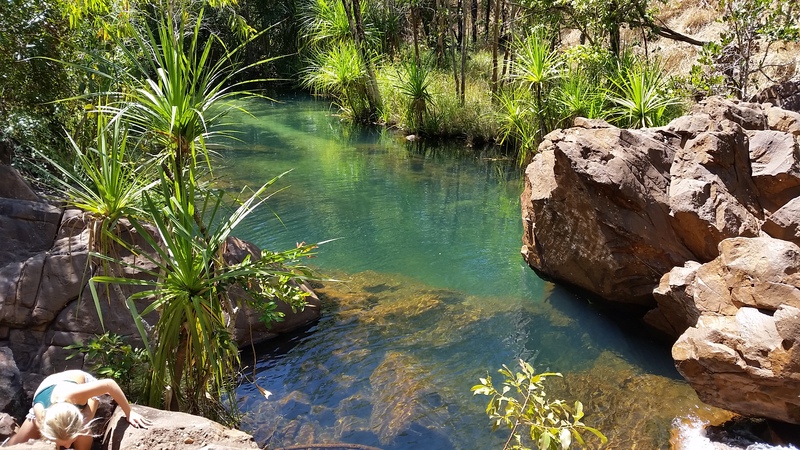 The plunge pool at the bottom of Gunlom Falls, home to a 3 metre freshwater crocodile. 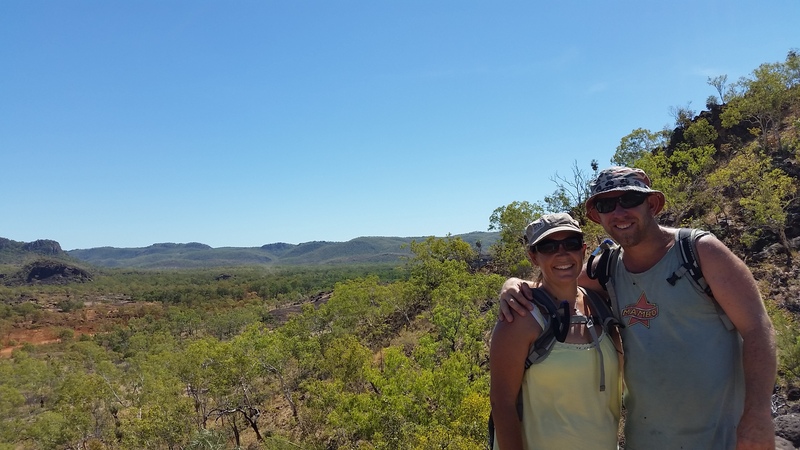 Not far from camp, we set off on another hike at the Yurmikmik Walks, this one was a 8km return to Motor Car Falls. To beat the heat of the day we set off early, this time being organised and on the trail by 8am. 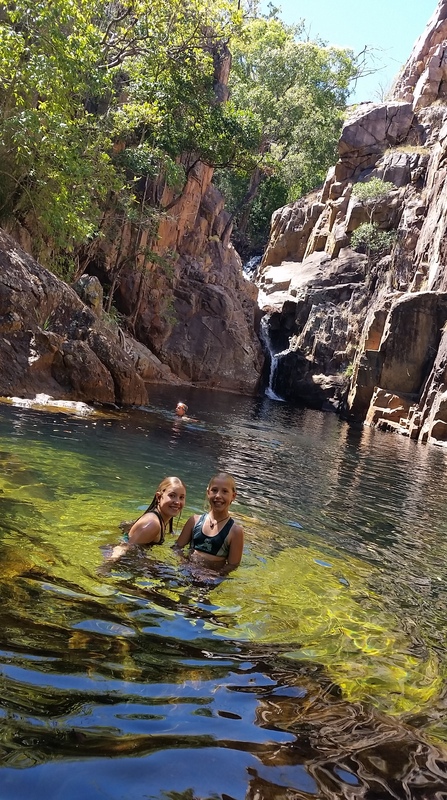 The hike was relatively easy and we were rewarded with a gorgeous swimming hole and water fall that was still flowing, only just though. 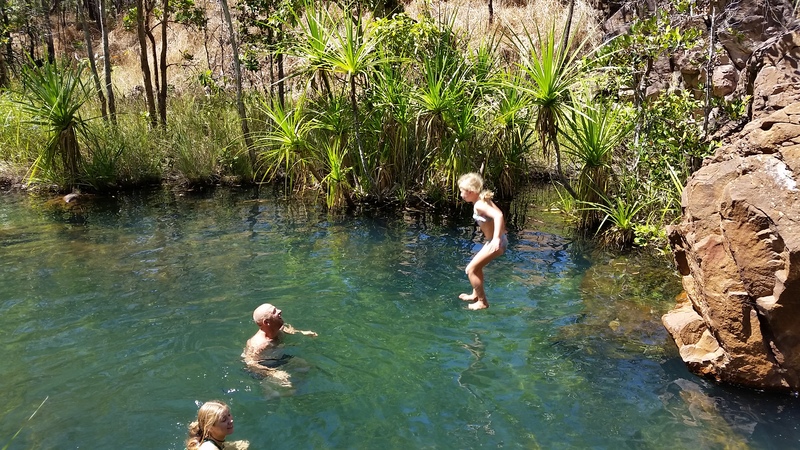 We spent a few hours there swimming, exploring and taking photos, the girls weren’t game to try and touch the bottom of this waterhole as the water got quite dark the deeper it went. 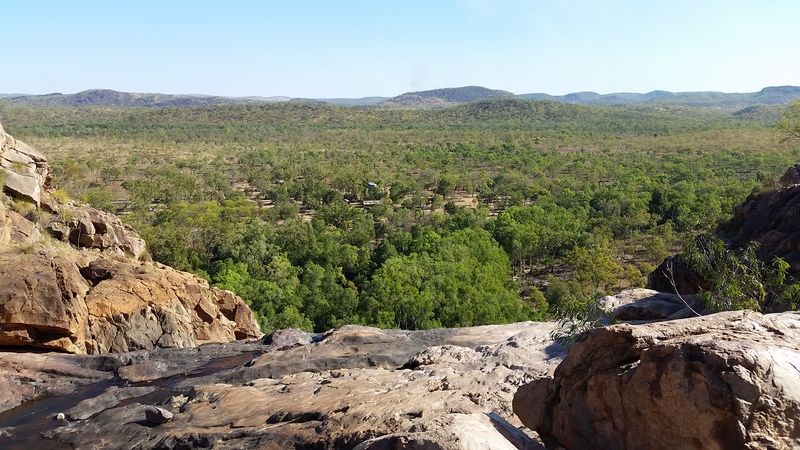 As we were early we had the place pretty much to ourselves until just before we started the hike back to the car, which turned out to be a little harder with the heat and sun belting down, however we still managed to do a quick detour to the lookout for some great views and photos. 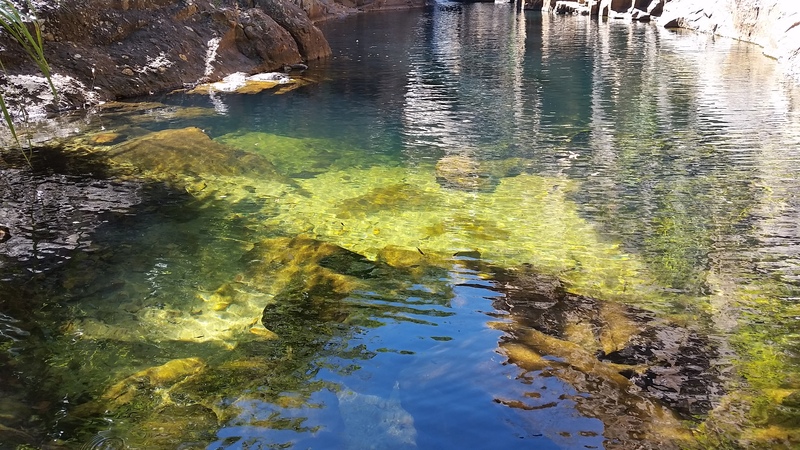 Amazingly clear waters of Motor Car Falls. Nik and I at Yurmikmik lookout. The rest of the day we spent exploring a few secret spots of Kakadu which the camp host had told us about the night before, he had to give us directions on how to get there, as neither of them were mentioned in any of the tourism books, info centres, signposted or even on Wikicamps (the traveller’s bible). 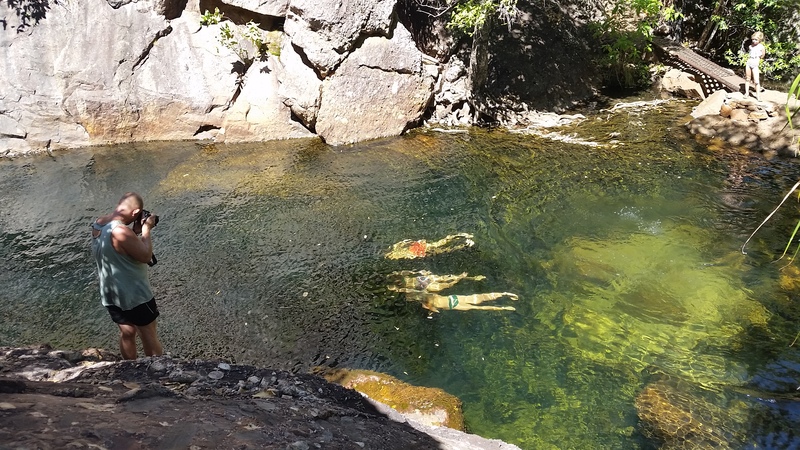 The first one we found was Fern Pool and was absolutely wonderful, the water was crystal clear and it even had a sandy bottom and a 3 tier waterfall for us to enjoy. We ended up staying here for a few hours, swimming, having lunch and even spotting a turtle, whilst we were there we didn’t see another soul. Of course the camp host had told us we could swim here, but I just wanted to be doubly sure so we conducted our own 2 point ‘croc test’, first we threw decent sized rocks in the grassy shallows and any black holes we saw and waited for things to move…… once happy with that, the next step was simply to send Nik in first and wait a few minutes by pretending we were all scared to get in. If he was still happily swimming, then the water was given the all clear for the rest of us. Clearly the best way to get in!!! 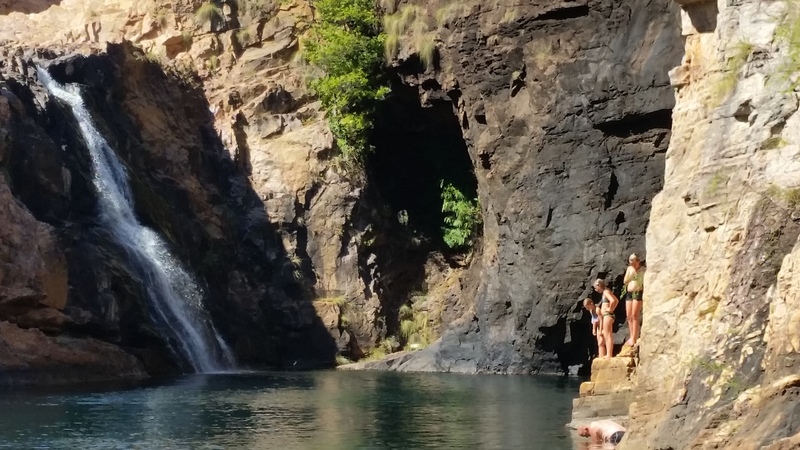 Our next secret spot involved a spring fed waterfall falling into yet another deep bottomless hole, surrounded by huge rocks. 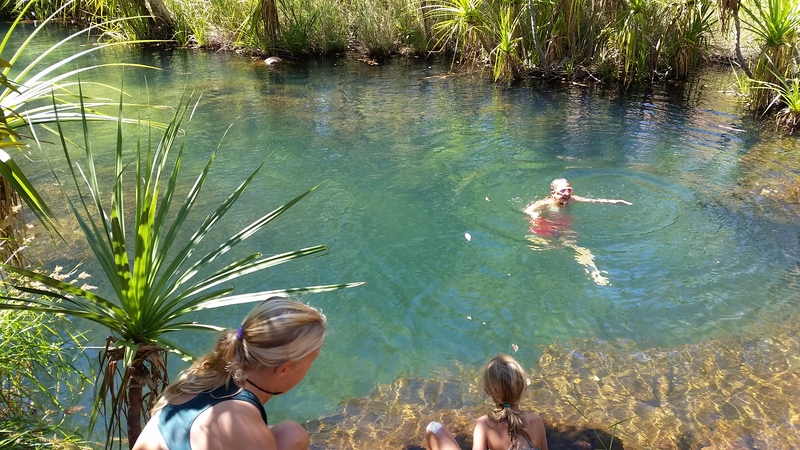 Once the croc test gave the green light we jumped and spent the next hour swimming and keeping cool, as the day had certainly warmed up. As usual Nik and the girls found some rock cliffs to jump off, either for the fun of it or just to stress me out a bit. As we were getting out we also spotted a water monitor who tried to evade us, he was a decent size and much to our disappointment was able to hold his breath and stay under water for quite a while, so much so that we got sick of waiting for him to come back up to the surface so we left. What an awesome day exploring, hiking and swimming we had!!!! We were extremely exhausted and water logged but pleased that we had been ‘wowed’ yet again. 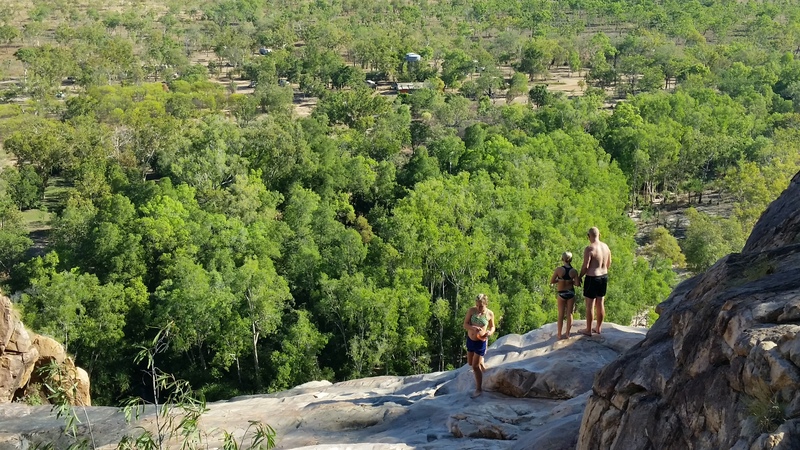 Considering before we came we hadn’t been overly excited heading into Kakadu, so far I can safely say we are loving it!!! 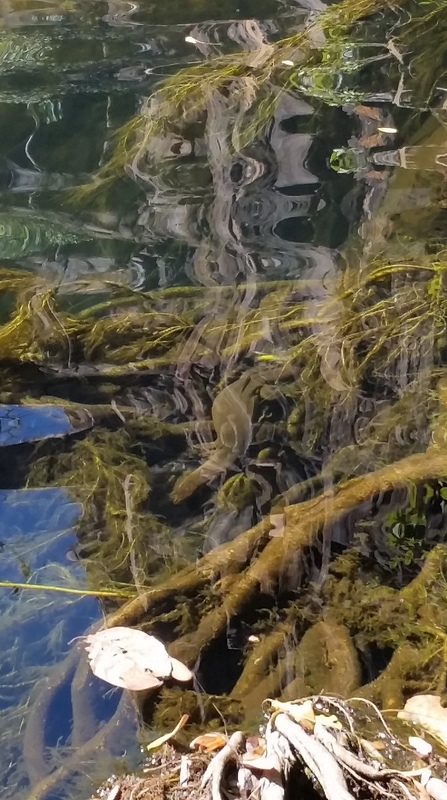 Resident water monitor trying to hide from us under water. Can you see him…. From Gunlom we packed up and headed further north, first taking a 12km detour off the highway to a stunning gorge and waterfall called Maguk. 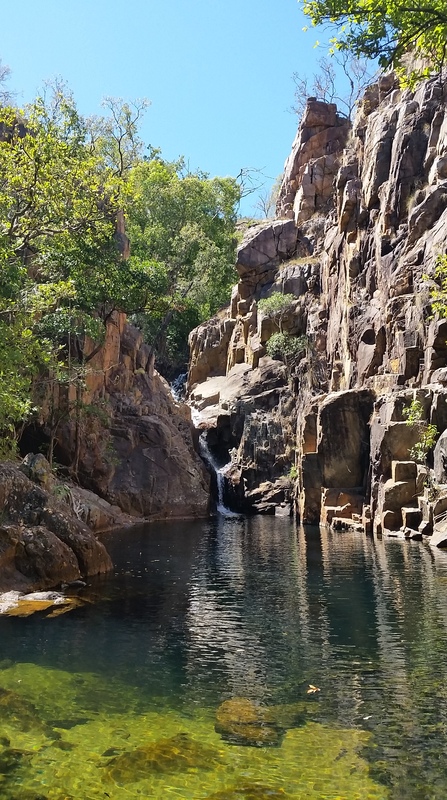 We arrived around 9:30am, found a shady spot to park the car and caravan and hiked in on a diverse tropical, rocky creek track for about 1km to be met by a stunningly large plunge and waterfall. Thankfully the tour bus that was there were leaving as we arrived, so bar another 4 people we were able to have the place to ourselves for a bit. 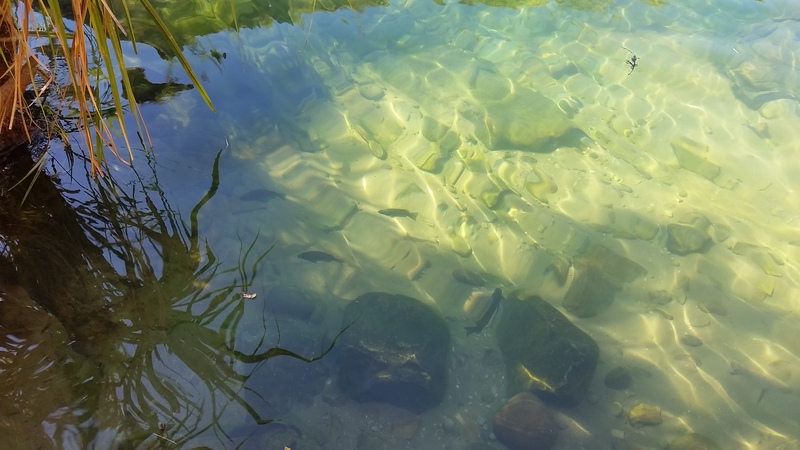 The water was once again crystal clear, inhabited by many fish who were not afraid to come and nibble on our toes if we sat still long enough. 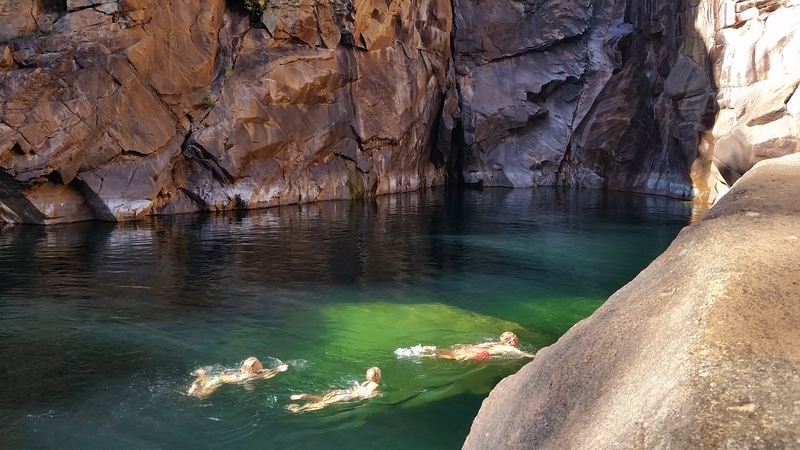 We soaked up the beauty of the place as we swam, once again finding some nice rocks to jump off in the warm water. We also saw some people who had hiked up the top of the falls, a hike we had decided to pass on as we were all a bit exhausted from the 20km we had hiked in the last 4 days. 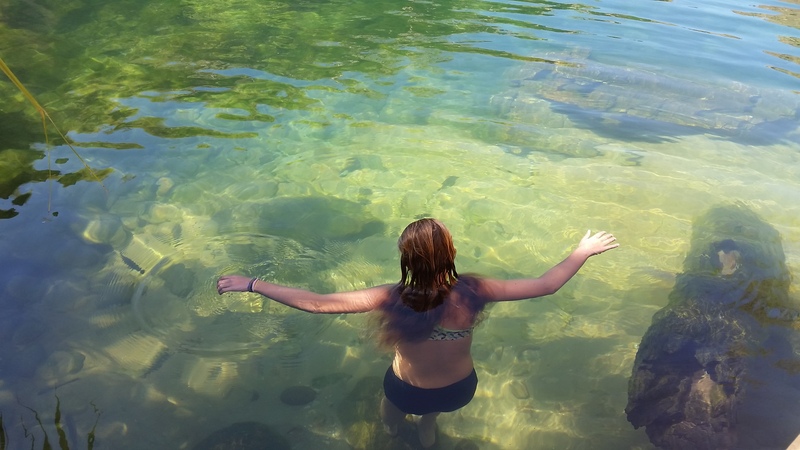 So instead we let our muscles relax as we floated in the beautiful water. Unfortunately our peaceful swim came to an end as more and more people started arriving, so figuring that was our cue to get going, we had a quick bite to eat and headed back, passing at least 50 people walking in and arriving back to a very full car park. Just in the nick of time too, as a car tried to park right in front of us blocking our way out, to which we politely told them to move their car…… Manoeuvring our way out of the carpark we headed back to the highway, heading north towards our next adventure and destination on our OZLAP………………. Of course if we find a high rock, we must jump off it!!! Zoe in her element and soaking it up. We think this girl has gills…..